This week the UK has seen the first ever Green GB Week. From the 15th – 19th October the UK Government has been promoting an awareness campaign for their Clean Growth Strategy. The campaign aims to raise awareness of reducing emissions, growing the low carbon economy and creating a better environment for all of us. Their goal is for all of us to pledge to take action and drive the UK’s future clean economy. The environmental impact of climate change is one of the biggest challenges facing the world today, which is why we understand the importance of reducing our carbon footprint. That’s why we’re beginning to launch our new energy solutions services, to help businesses control their energy usage and see how we can support their green ambitions to improve their carbon footprint. 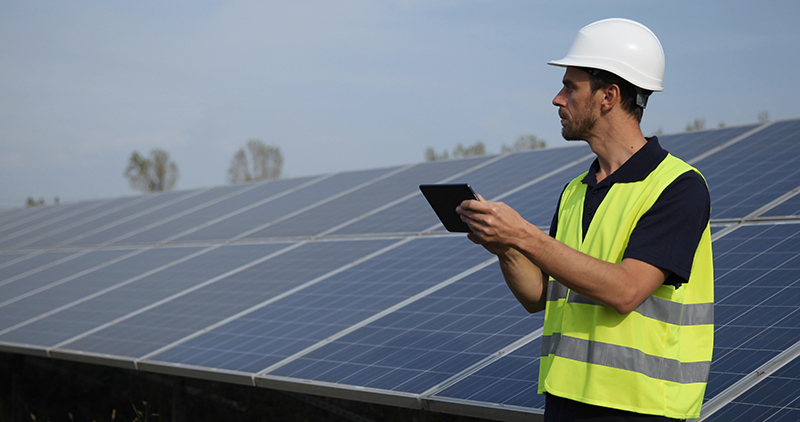 We now offer a variety of energy-related solutions to help you control your business energy usage, optimise the potential of your assets and advise you on any aspirations you have for generating your own energy. A Power Purchase Agreement is a contract which allows you to generate and sell your own renewable energy. Many energy suppliers, like ourselves, offer financial stability to allow businesses to get renewable and sustainable energy projects developed. Pricing is determined on a site-by-site basis taking into account the specific technology, location, size and level of export that is forecasted. There are a range of agreements available based on fixed or variable tracker rates, for long or short-term contract periods. Fixed PPAs set a competitive price for power over a period of time. This deal can offer additional attractive portfolio benefits when combined with any gas or power import. For larger generators (capacity over 1MW) our fixed price is offered for a period of up to 5 years. For smaller generators (10kw – 1MW) our fixed price is offered for 1 year and covers all forms of generation, including those accredited under the Feed-in-Tariff (FiT). Variable PPAs track the market price and can help to maximise your financial return. This means you can take advantage of price spikes in the market to get the best price available, but it does introduce an element of risk should market prices change. These deals can be offered for periods of up to 20 years. A big topic during Green GB Week and in the news recently, is electric vehicles (EV) and reducing the number of petrol and diesel vehicles on the road. The Government are pushing for more EV ownership and more businesses to provide EV charging points for their employees, visitors and customers. At Yü Energy, we offer solutions for your EV strategy. We can provide the right size and type of charging point, or help to finance the installation and manage the project from start to finish. We can provide businesses with hassle-free and competitive installation services to get your electric vehicle strategy on the road. It’s a no brainer that reducing energy consumption can reduce energy costs and support the environment. That’s why energy suppliers are developing services to support their customers in managing their energy demand. That’s exactly what we’re doing at Yü Energy. Our Energy Management service will help customers to understand their energy consumption whilst offering support and advice on ways they can move their demand to different times. From analysing daily consumption patterns, we can gain an understanding of a business’ energy usage which can often highlight small changes in the company’s behaviours that can make a big difference to consumption and cost. We also have a number of energy plans that can work hand-in-hand with a load management exercise, ensuring that you get the best possible price whilst avoiding the impact from times when electricity is most expensive. We also offer certified Green energy plans which give you peace of mind that the energy you are consuming is sourced from 100% renewable generation. Demand Side Management is another service offered for customers wishing to take their energy management a step further. We can support businesses who are looking to lower consumption and actively manage demand at key times as notified by the National Grid. For high volume users it could deliver an additional income stream for your business. If you’re interested in improving your businesses energy efficiency and want more information about our Energy Solutions services, speak to a member of our team today.